Reference: Cotos, E., & Pendar, N. (2016). Discourse classification into rhetorical functions for AWE feedback. calico journal, 33(1), 92. Computational techniques can be exploited to provide individualized feedback to learners on writing. Genre analysis on writing to identify moves (communicative goal) and steps (rhetorical functions to help achieve the goal) [Swales, 1990]. Natural language processing (NLP) and machine learning categorization approach are widely used to automatically identify discourse structures (E.g. Mover, prior work on IADE). 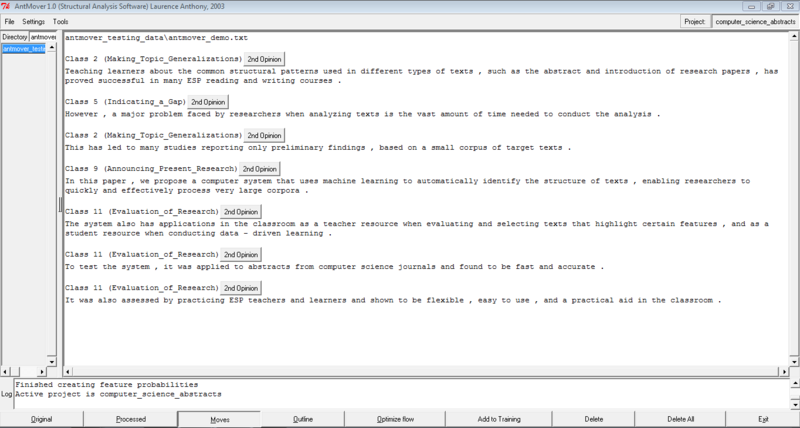 To develop an automated analysis system ‘Research Writing Tutor‘ (RWT) for identifying rhetorical structures (moves and steps) from research writing and provide feedback to students. Sentence level analysis – Each sentence classified to a move, step within the move. Data: Introduction section from 1020 articles – 51 disciplines, each discipline containing 20 articles, total of 1,322,089 words. 3 moves, 17 steps – Refer Table 1 from the original paper for detailed annotation scheme (Based on the CARS model). Manual annotation using XML based markup by the Callisto Workbench. n-gram feature set contained 5,825 unigrams and 11,630 trigrams for moves, and 27,689 unigrams and 27,160 trigrams for steps. Each sentence is represented as a n-dimensional vector in the R^n Euclidean space. Boolean representation to indicate presence or absence of feature in sentence. precision higher than recall – 70.3% versus 61.2% for the move classifier and 68.6% versus 55% for the step classifier – objective is to maximize accuracy. RWT analyzer has two cascaded SVM – move classifier followed by step classifier. Move 2 most difficult to identify (sparse training data). Move 1 gained best recall- less ambiguous cues. 10 out of 17 steps were predicted well. Overall move accuracy of 72.6% and step accuracy of 72.9%. Moving beyond sentence level to incorporate context information and sequence of moves/steps. Knowledge-based approach for hard to identify steps – hand written rules and patterns. Voting algorithm using independent analyzers. Wu, J. C., Chang, Y. C., Liou, H. C., & Chang, J. S. (2006, July). Computational analysis of move structures in academic abstracts. In Proceedings of the COLING/ACL on Interactive presentation sessions (pp. 41-44). Association for Computational Linguistics. Swales pattern for research articles: Introduction, Methods, Results, Discussion (IMRD) and Creating a Research Space (CARS) model. Studying the rhetorical structure of tests is found to be useful to aid reading and writing (Mover tool notes here). To automatically analyze move structures (Background, Purpose, Method, Result, and Conclusion) from research article abstracts. To develop an online learning system CARE (Concordancer for Academic wRiting in English) using move structures to help novice writers. Data: Corpus of 20,306 abstracts (95,960 sentences) from Citeseer. Manual tagging of moves in 106 abstracts containing 709 sentences. 72,708 collocation types extracted and manually tagged 317 collocations with moves. Hidden Markov Model (HMM) trained using 115 abstracts containing 684 sentences. Precision of 80.54% achieved when 627 sentences were qualified with following parameters: weight of transitional probability function 0.7 , frequency threshold for a collocation to be applicable – 18 (crucial to exclude unreliable collocation). CARE system interface created for querying and looking up sentences for a specific move. System is expected to help non native speakers write abstracts for research articles.